The SYSPRO-AHD16BX is a high definition surveillance system that includes 16 HD security cameras, a hybrid HD CCTV DVR, pre-made video / power cables, and power supplies. 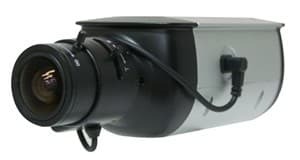 The AHD-BX3-28 cameras that are included with this system are indoor rated, but can be used outdoor with an optional outdoor housing or heater / blower housing. The 2.8 ~ 12mm varifocal lens allows the installer to adjust the angle of view from a very wide angle to a more zoomed view. For low light environments this camera features a lux rating of 1.0 in color mode and 0.1 in black & white mode. The iDVR-PRO16A surveillance DVR that is included with this system works with traditional standard definition analog CCTV cameras as well as the latest 720p and 1080p HD CCTV cameras. Users can login to their DVR to view their cameras live and also play back recorded video surveillance footage using the Mac, Windows, iOS, and Android apps that are included for free. This surveillance system supports 1080p HD video. View these examples images to see the resolution of the system. The AHD-BX3-28 cameras that are included with this system. The following video surveillance snapshots were captured using an AHD-BX3-28 connected to an iDVR-PRO DVR. Please click on the images to see the full sized 1080p resolution photos. The above image was captured with the camera lens set at the widest setting - 2.8mm. You can see that the 2.8mm setting provides an approximate 109-degree field of view. The garbage dumpster in the background is located 90 feet away from where the camera is mounted. This image was captured with the camera lens set at the most narrow / zoomed in setting - 12mm. You can see the difference in the field of view / zoom when you compare the 2.8 to 12mm. The 12mm setting captures a 22-degree field of view. This camera's megapixel lens can be adjusted anywhere in between these two settings as well. The camera's location has not changed. The garbage dumpster is still 90 feet away. The lens has been adjusted to bring the view much closer. The graphical user interface on all iDVR-PRO models is the same and super easy to use. Users can navigate the menu system and settings using the USB mouse that is included with all DVRs. Watch the below video to see how easy it is to use. Important Note: Click the gear icon in the lower right of the video player and select 1080p HD resolution so that you can view the video in the highest resolution available. Watch this video to see what recorded HD video surveillance footage looks like when played back on the iDVR-PRO DVR included with this system. All iDVR-PRO models work with a free native iPhone app to view cameras remotely. The DVR viewer app for iOS supports live remote viewing and recorded video search and playback. You can learn more about the iDVR-PRO Viewer app for iOS here. Watch this video to see the iPhone app remotely viewing security cameras connected to an iDVR-PRO DVR. Important Note: Click the gear icon in the lower right of the video player and select 1080p resolution so that you can view the video in the highest resolution available. All iDVR-PRO systems include the Android mobile app that allows users to login to their DVR and view all of their CCTV cameras live from remotely over the Internet. The Android app also supports remote search and playback of recorded video surveillance footage. You can learn more about the iDVR-PRO camera viewer app for Android here. Watch this video to see how the remote camera viewing from Android works. All iDVR-PROs HD CCTV / hybrid models are Mac compatible. The Mac software that is included supports viewing multiple DVRs / locations and remote search and playback of recorded video. The latest Mac software supports 1080p resolution cameras. In addition to the Mac software, users can view security cameras live directly from a web browser (Chrome, Firefox, Safari). CCTV Camera Pros highly recommends using the Mac software for remote viewing. The experience and video quality is much better than the web browser access. You can learn more about the Mac DVR client / camera viewer software for iDVR-PRO here. This video demonstrates live HD security camera viewing using the Mac software for iDVR-PRO. The Windows CMS software that is included with the HD CCTV systems on this page allows users to remotely view their security cameras, playback recorded video surveillance footage, and manage their DVR(s). This software is referred to as CMS (central management software) because it supports the ability to connect to multiple DVR locations and create custom camera views consisting of cameras as those multiple locations. You can learn more about the Windows DVR viewer software here. This video demonstrates live HD security camera viewing using the Windows software for iDVR-PRO. The below playlist contains all of the current iDVR-PRO videos that CCTV Camera Pros has made. Please watch the videos in the below playlist to get familiar with the DVR included with this system. Did you know? CCTV Camera Pros can provide a complete surveillance system quote that includes an iDVR-PRO surveillance DVR, any number of cameras, cables, connectors, power supplies, and monitors? As you have probably already seen on our website, we have 2, 4, 8, and 16 camera surveillance systems in pre-made packages. However, it is not possible for us to package up every combination and quantity of all the different camera models that we carry. So, we can also provide you with a custom quote with as many cameras as you need and a mix of any combination of camera model(s) based on your project requirements. Demo: Try Before You Buy! Would you like to demo a iDVR-PRO before you decide to purchase one? CCTV Camera Pros has a demo surveillance system setup at our office using an iDVR-PRO and a variety of CCTV cameras that we supply. We will supply you with login information and instructions so that you can see what the user experience is like when you remotely access an iDVR-PRO from Mac, Windows, iPhone, iPad, and Android devices. If you need support along the way, we will provide you with help.